Jennifer Ingels is the new postmaster of the Holton Post Office. “I enjoy serving my community, and I like to give back,” Ingels said. Ingels started serving as postmaster on Nov. 28. During the month of November, she was interim postmaster, also known as the officer-in-charge, at the St. Marys Post Office. The Denison native and Holton High School graduate (Class of 1987) began her career at the Holton Post Office in December 1999 as a temporary rural carrier. “I was a single mother with two little kids and three jobs,” she said, noting she also served as the clerk for the city of Denison and as an auctioneer clerk for Holton Livestock Exchange. She was promoted to a rural carrier assistant, which was a part-time position, in 2003. She began working full-time for the post office in 2006 as a regular rural carrier. She became acting supervisor in 2013. Ingels said that she enjoyed being a rural carrier but that she felt she had “more to offer” in a management position. A few years ago, the Holton Post Office began overseeing operations at five other area post offices, including Mayetta, Circleville, Netawaka, Denison and Wetmore. There are no longer postmasters at those locations. Between rural carriers and clerks at all the post offices, Ingels oversees 31 employees. 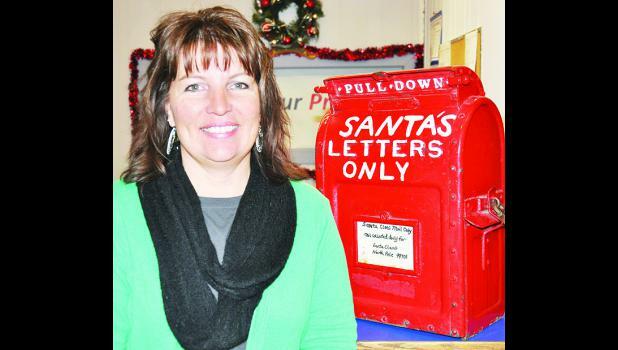 Ingels said she hopes to provide some stability in the postmaster position in Holton, which has experienced many postmasters and interim postmasters in the last several years. Ingels has two children, Samantha Herring, 20; and Cole Herring, 17. Her husband, Kevin, serves as the fire chief for the city of Holton. Ingels is the daughter of Richard and Rosalie Lassiter of Denison. * Lanette McKee (officer-in-charge) appointed July 22, 2014. * Vicki L. Mccune-Streit (postmaster) appointed Jan. 25, 2014. * Brian Kist (officer-in-charge) appointed May 2, 2013. * Laurie A. Bergey (postmaster) appointed Dec. 1, 2012. * Karen A. Schumann (officer-in-charge) appointed July 19, 2012. * Cheryl V. McKinnon appointed officer-in-charge on Sept. 8, 2010, and then postmaster on July 16, 2011. * Margaret A. Meyer (officer-in-charge) appointed June 9, 2010. * Mickael G. Slater (officer-in-charge) appointed March 25, 2010. * Lynette A. Mullinax (postmaster) appointed Feb. 2, 2008. * Karen Schumann (officer-in-charge) appointed Oct. 24, 2007. * Lana K. Sloan appointed officer-in-charge on May 9, 2000, and then postmaster on Dec. 16, 2000. * Paul L. Rivera (officer-in-charge) appointed Jan. 26, 1999. * Robert H. Garcia (officer-in-charge) appointed Oct. 15, 1998. * Larry D. Ewing (officer-in-charge) appointed July 23, 1998. * Susan E. Wallace (postmaster) appointed Jan. 23, 1993. * Douglas E. Farmer (officer-in-charge) appointed Aug. 20, 1992. * David C. Kuglin (postmaster) appointed Oct. 18, 1980. * Daniel R. Kenney (officer-in-charge) appointed June 27, 1980. * Robert A. Billquist (postmaster) appointed Nov. 22, 1975. * Paul Scheid (officer-in-charge) appointed July 1, 1975. * Donald G. Sands was appointed acting postmaster on June 22, 1962, and then postmaster on July 26, 1963. * Reuben H. Moore was appointed acting postmaster on May 21, 1953, and then postmaster on March 1, 1954. * Ralph E. McGinnis (acting postmaster) appointed Feb. 28, 1949. * Reuben H. Moore (acting postmaster) appointed Jan. 31, 1949. * Arch E. Hosmer was appointed acting postmaster on Jan. 8, 1934, and then postmaster on May 29, 1934. * William T. Beck was appointed acting postmaster on Aug. 1, 1923, and then postmaster on Dec. 18, 1923.